ignores my plea for coffee. windows. The grill fizzes with fat. replaces it on the grill. sneers through a window at me. for coffee, I gnash my molars. frosted with fatal black ice. screaming into a cell phone. plowed forward madly on its own. the snow-ruts of the highway. wound of river rimmed with ice. I won’t be edible in death. and animate as a shaman’s. drift on the gray edge of mist. on the carcass of a rotting seal. eight hundred miles to its apex. flashes a razor at my throat. a cigar as crude as a twig. His hands resemble manhole covers. fits us like a chain-mail sweater. or astrologers to fully parse. in the drollest primary colors. how neatly concealed by the table. even though sometimes they rhyme. the dark. I’ve lain awake for hours. flat at the rear of the building. where drug murders often occur. swim through the first streaks of light. the body awkward as a question. as the bellows of a blacksmith. I let him sleep away the morning. I’m gulling them, and stalk away mad. such derision of the brain. Copyright 2008, William Doreski. © This work is protected under the U.S. copyright laws. It may not be reproduced, reprinted, reused, or altered without the expressed written permission of the author. 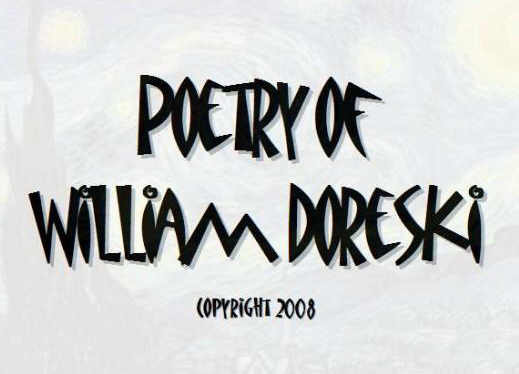 William Doreski has a PhD from Boston University and teaches writing and literature at Keene State College in New Hampshire. His most recent collection of poetry is Another Ice Age (AA Publications, 2007). He has published three critical studies, including Robert Lowell’s Shifting Colors. His essays, poetry, and reviews have appeared in many journals, including Massachusetts Review, Notre Dame Review, The Alembic, New England Quarterly, Harvard Review, Modern Philology, Antioch Review, Natural Bridge.